Rudolf Belling. Sculptures and Architectures. Rudolf Belling was celebrated, ostracized and finally forgotten. 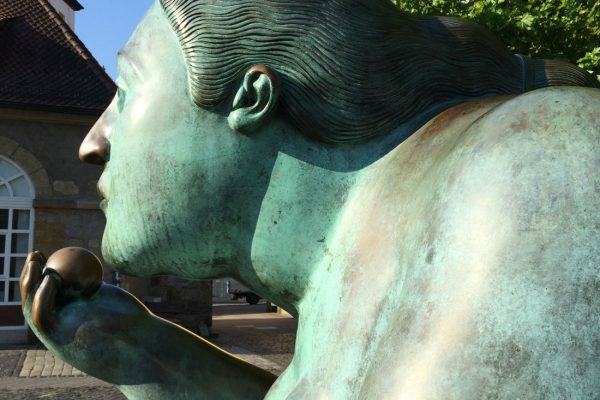 In the Weimar Republic Rudolf Belling, born in Berlin in 1886, ranked among the most outstanding German sculptors of classical modernism alongside Wilhelm Lehmbruck and Ernst Barlach. 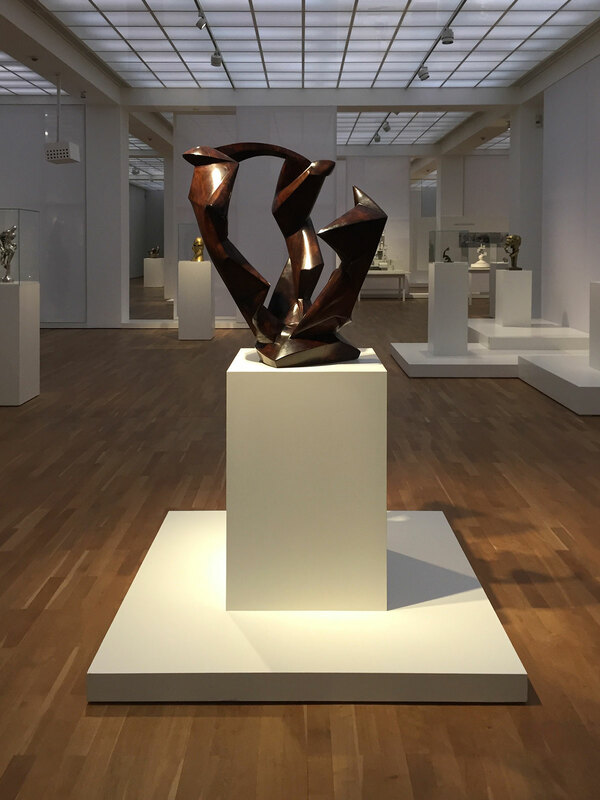 The Nationalgalerie dedicates the first retrospective since 40 years to the pioneer of abstract sculpture in Germany in the Hamburger Bahnhof – Museum fuer Gegenwart with the objective of bringing Berlin’s son back into public focus and revaluing his wrongly forgotten work. 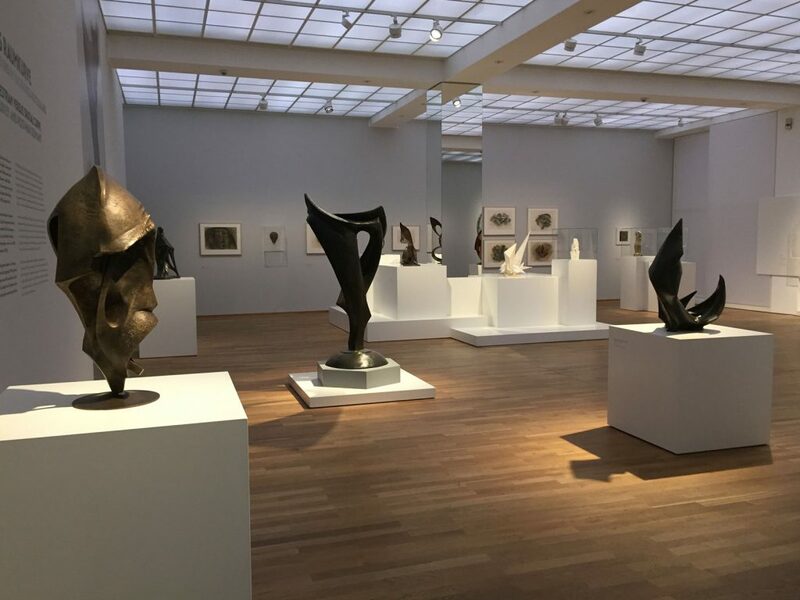 About 80 works from all creative periods that are grouped around the eleven major works from the 1920s which are in possession of the Nationalgalerie make Rudolf Belling and his importance as allround artist of the avantgarde appear in a different light. 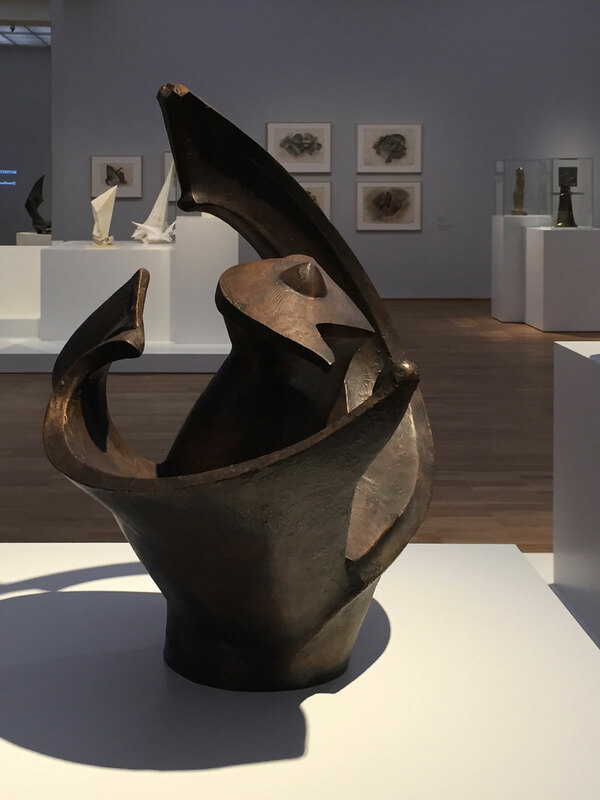 Alongside sculptures, among them his most famous work Dreiklang (Triad) from 1919, drawings, historic photographs, films and reconstructions of models are on display that offer a view on a multitalented artist who doesn’t fit into any scheme. In 1922 Belling wrote “If figurative or non-objective, I take the liberty of anything that seems to be necessary to me to shape according to correct organic principles“. His versatility and his talent to move perfectly between the styles that were trendy in classical modernism made him a sought after commission artist. However, Rudolf Belling didn’t let himself be committed to the classical genre of sculpting, but worked as designer, scenographer and architectural sculptor as well. The fact that he eluded the common understanding of classical fine arts made it difficult for art critiques to classify him, they interpreted his multi-faceted approach as eclecticism. The foundation for this versatility was already laid in his artistic education. After a commercial apprenticeship Rudolf Belling was working in an artisan workshop and enrolled at a craft school, in addition he attended evening classes in drawing and modeling in order to gain further self-taught qualifications. Through theatre Rudolf Belling discovered expressionism. In 1908 he founded a studio for small-scale sculpture, decoration and applied arts, and it wasn’t long before he received commissions for theatre performances by Max Reinhardt. The world of theatre was an important source of inspiration for Rudolf Belling’s subsequent work and his cross-genre understanding of art. From 1910 on he was working in a stage workshop where he became acquainted with Ernst Stern, the expressionistic chief scenographer of Max Reinhardt, thus getting in touch with expressionistic art and literature. 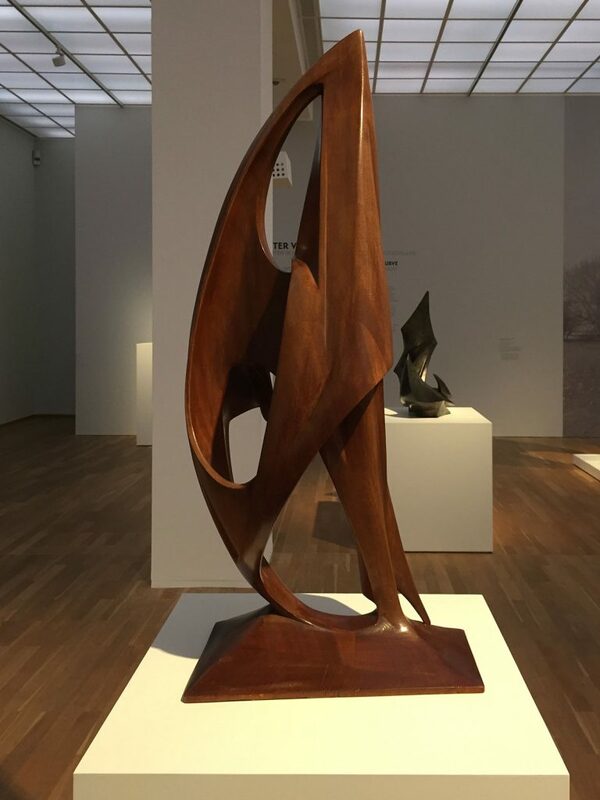 Beside theatre also dance influenced the development of his sculptural work very strongly, which was finally to culminate in his most famous work Dreiklang in 1919. 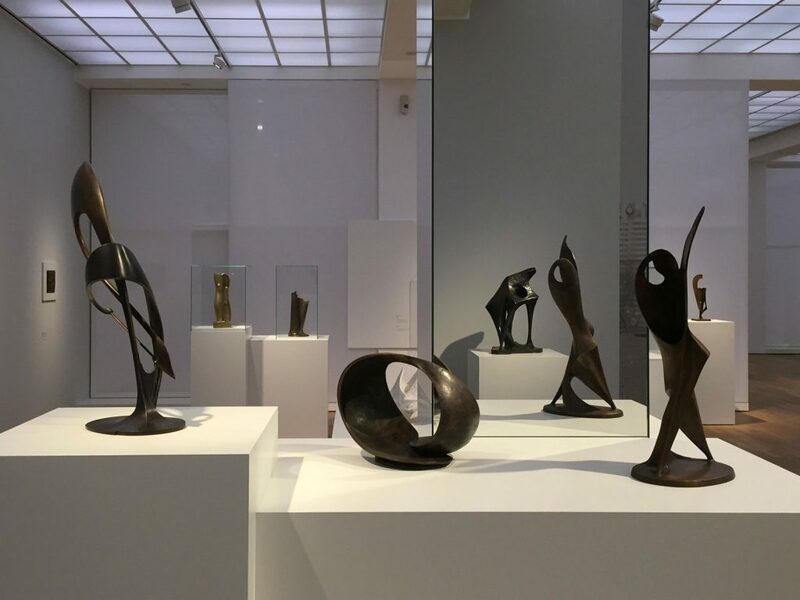 In 1911 Belling got the opportunity to study sculpture at the Kunstakademie Berlin-Charlottenburg and to put his autodidactic education on an academic basis, while he continued to earn his living from commissions for stage designs. He also worked for the cinema, for instance Belling created designs for Paul Wegener’s figure of the Golem. Today nobody would seriously question anymore that it is an artist’s legitimate right to work as character designer for the film industry. After the end of the First World War Rudolf Belling had survived as soldier in Macedonia and on the Western front the Weimar Republic was proclaimed in Germany. Peace was reflected in a creative intoxication among the artist crowd, the capitals of Europe got carried away by the maelstrom of avantgarde movements and revolutionary events. 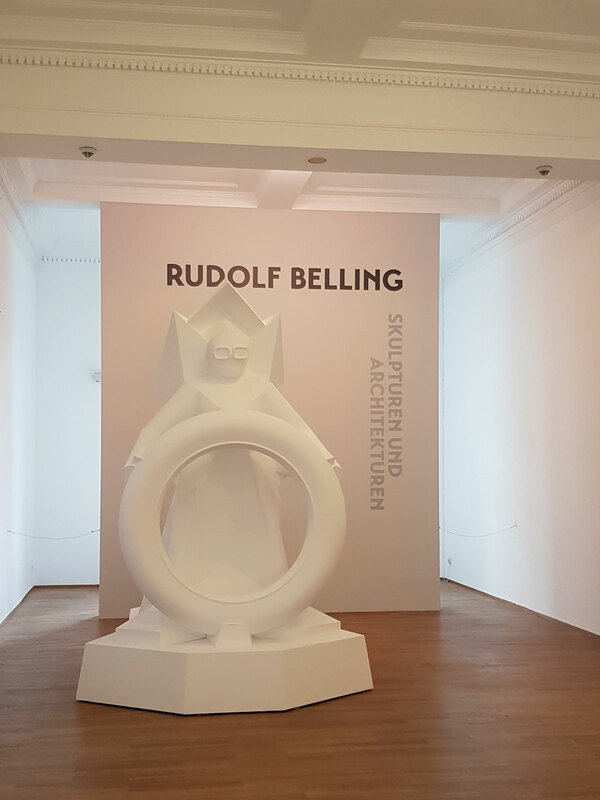 Rudolf Belling was member of the newly founded work council for art and co-founder of the progressive November Group, among the members of which were also Max Pechstein and the architects Erich Mendelssohn and Bruno Taut. The revolutionary spirit of the Weimar Republic inspired the circles of the intellectuals who discussed artistic ideas as well as social utopias and political goals. Rudolf Belling liked to mock the isms of modernism. From political discussions, however, Belling stayed away from, he considered himself as an artisan for whom the practice of sculptural designing was more important than establishing social utopias. According to his education he was in search of a synthesis of arts and crafts, with his experience as designer being helpful to immerse himself into the most different styles and to use them for his artistic objectives. Rudolf Belling had a brilliant command of all styles of classical modernism, such as naturalism, expressionism, cubism, constructivism, futurism, Neue Sachlichkeit and abstraction. 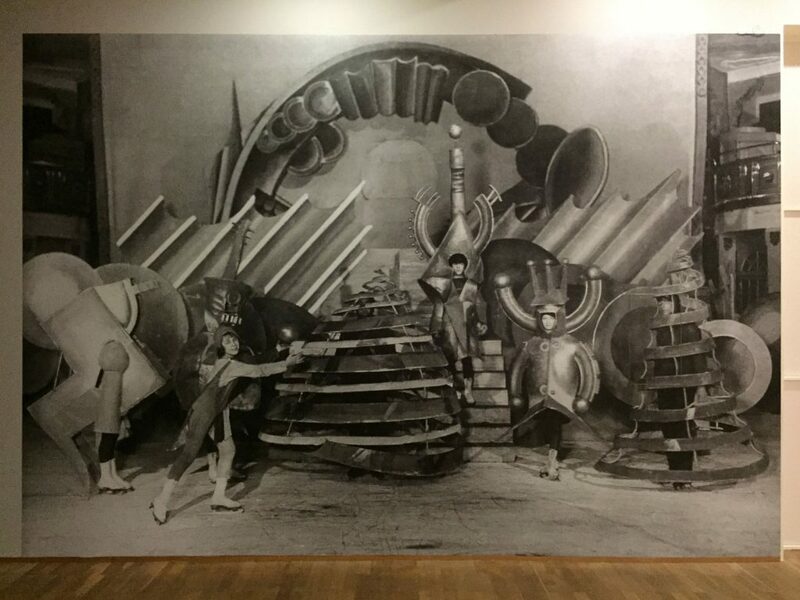 In 1921 he received the commission to design costumes and scenery of the ice skating ballet Futuristic Carnival for the ice rink of the Berlin Admiralspalast. The play caricatured the current art schools as “isms“ and mocked the art scene. The finale was a dance around the statue of the “ism“ shaped as an I with a dot. Rudolf Belling was the prototype of a universal artist who tried to break up the notion of genre, he didn’t see any contradiction between fine, performing and applied arts, that’s why it was his declared goal to unite arts with crafts and life itself. With this world view he was closer to the Renaissance artists than the avantgardists of the fragmented classical modernism with their ideological dogmas. One of his most spectacular achievements as a designer was the development of his extremely stylized faceless mannequins which he got patented from 1921 on. They replaced the then popular naturalistically modelled mannequins from wax and are considered as the prototype of the modern mannequin still today. 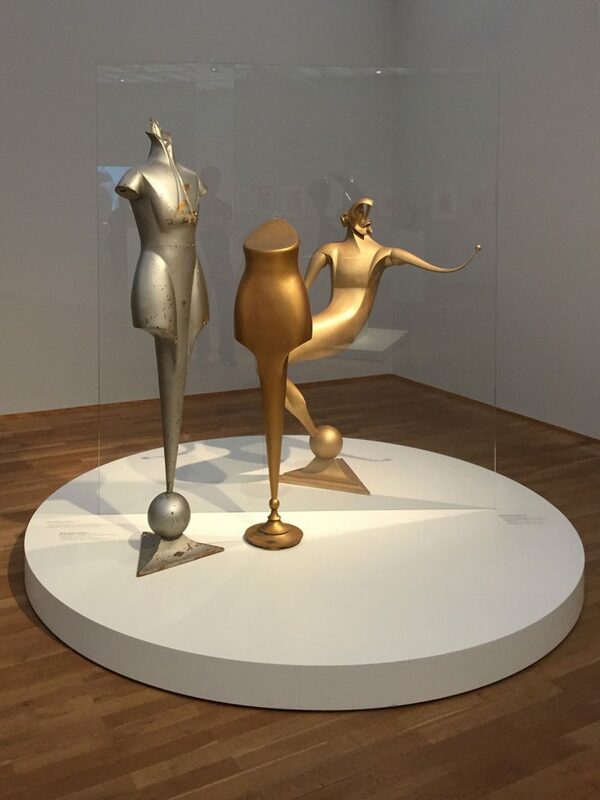 The simplified design vocabulary of Belling’s “fashion sculptures“, as he called them, already outlined the arising aesthetics of the Art Deco style, they were on display not only at the KaDeWe in Berlin, but were also exported to France and the USA. With the Dreiklang Belling created one of the icons of modernism in Germany. Belling had designed his pioneering Dreiklang already in 1919, however, it had been conceived as six meters high podium for music performances which was planned to be erected with brick stones. But initially only a plaster version was executed. 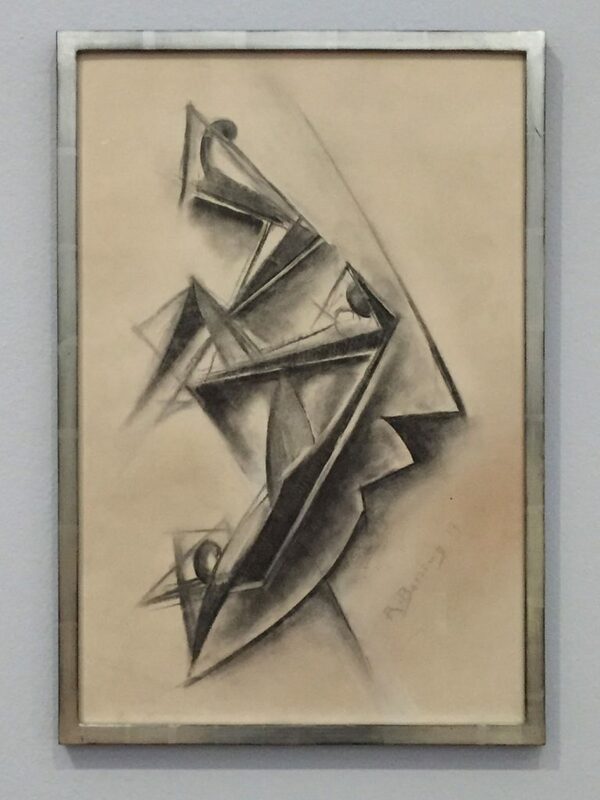 The Dreiklang was the first cubist abstract sculpture in Germany and beside futuristic and constructivistic design principles it was significantly influenced by Alexander Archipenko who was a friend of Belling’s. 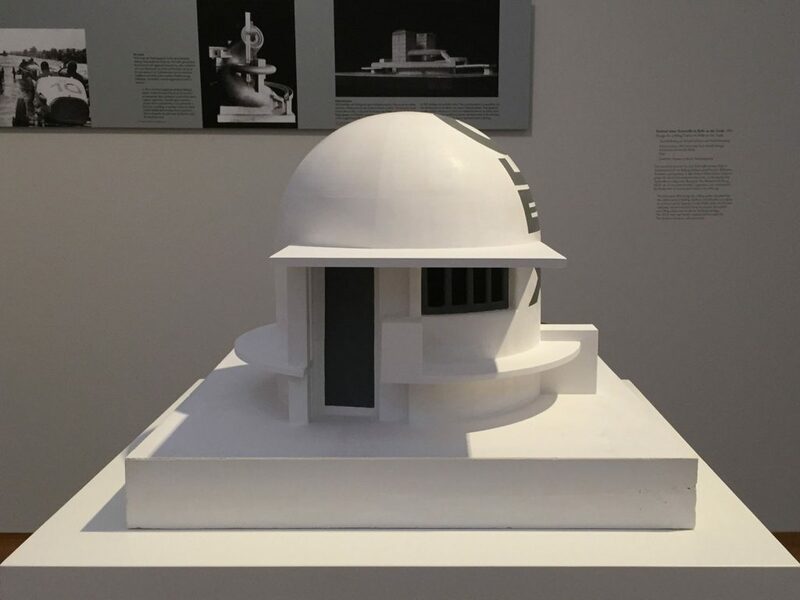 When he designed the Dreiklang, Belling’s vision was to create a gesamtkunstwerk that combined the artistic genres of painting, sculpture, architecture, dance and music. The Dreiklang is a structure with arms respectively figures in a triangular arrangement, similar to the mythological motif of the three Graces that raise to the air like flames and turn to each other. The rhythmic movement of dance and the sound of music spreading in space might have played a major role for Rudolf Belling. 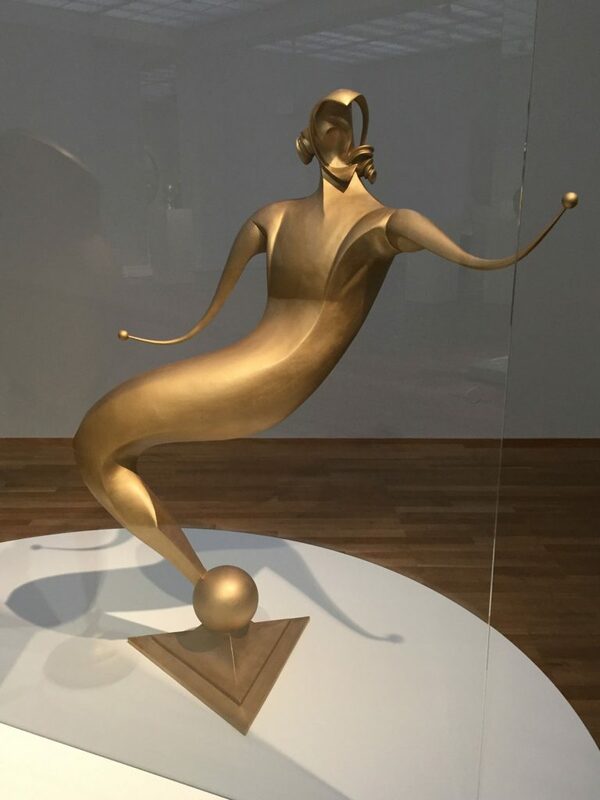 The essential innovation of the Dreiklang was the fact that is was designed as a multi-perspective round sculpture that changed according to the perspective of the viewer and set its forms in motion. Matter and the surrounding space respectively positive and negative form are treated equally by Rudolf Belling, the shaping of empty space became a signature feature of his sculptures. 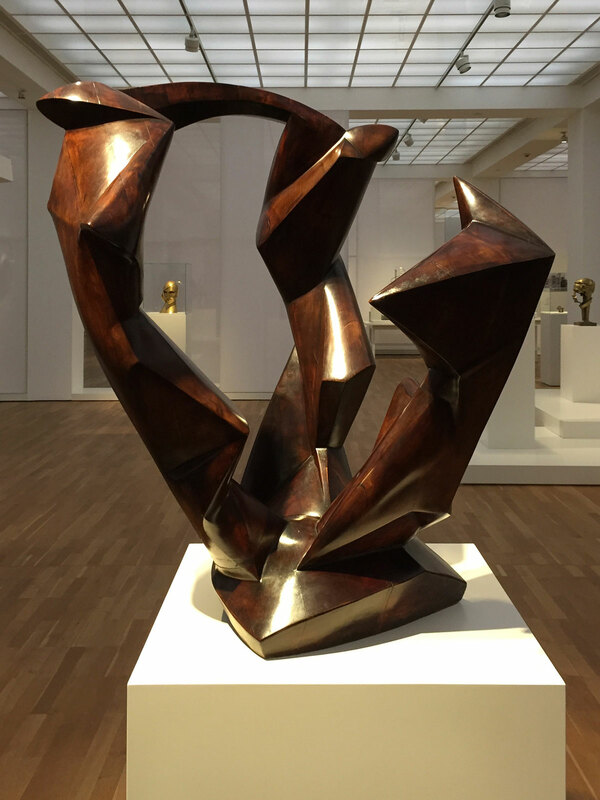 “When I create a sculpture, I organize the forms and make them grow like a tree or a human“ Belling described his philosophy, considering himself more a craftsman than an artist. In 1924 Ludwig Justi, director of the Nationalgalerie, dedicated the first solo exhibition to Belling who was then represented by the gallerists Flechtheim and Gurlitt at the Kronprinzenpalais. 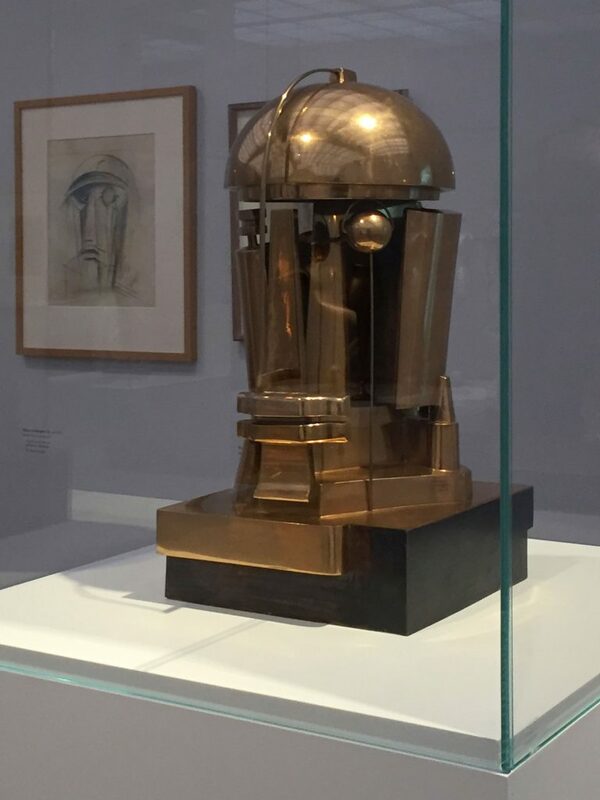 The title of the exhibition back then was “Rudolf Belling. Skulpturen und Architekturen“ which is adopted by the present retrospective. After the end of the exhibition Justi purchased a wooden version of the Dreiklang, executed in birch wood and colored in mahagony, thus laying the foundation for the collection of works by Rudolf Belling at the Nationalgalerie. Art and design were no contradiction for Rudolf Belling. In the 1920s Belling turned his attention increasingly to the relationship between man and machine which is reflected in numerous commissions for industrial design. For the inauguration of the Automobil- Verkehrs- und Uebungsstraße (AVUS) in 1921 he designed a seven meters high advertising sculpture on behalf of the tire manufacturer Pneumatik Harburg-Wien. The figure wearing racing goggles has put down a tire in front of itself like an ancient hero a shield, it appears like the incarnation of the futuristic belief in progress in the Roaring Twenties, a homage to power and speed. 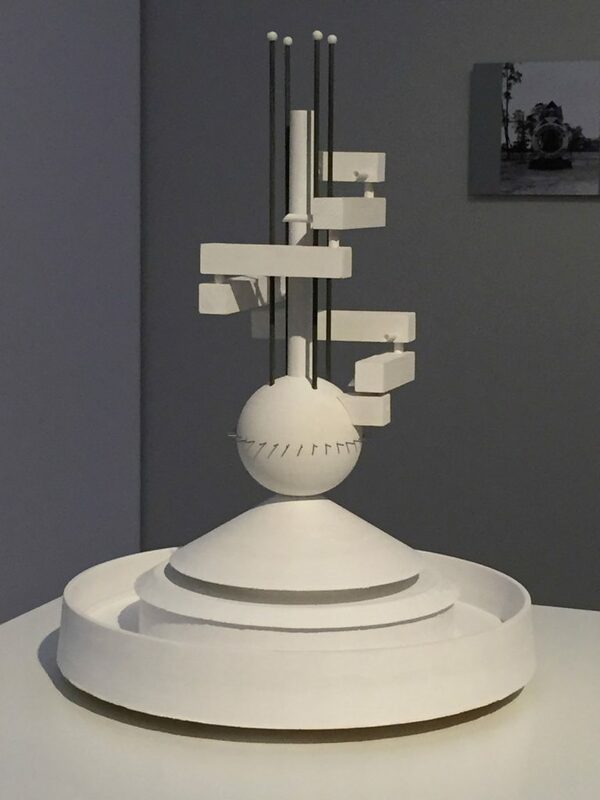 Alongside the fashion sculptures and architectural models the scaled down reconstruction of the Avus advertising sculpture was carried out by students of the studies model + design at the Technische Universitaet Berlin. 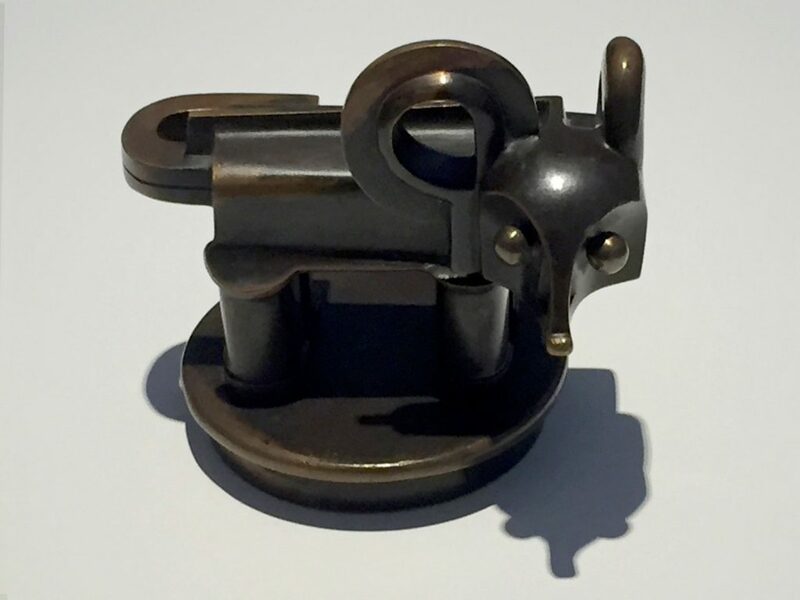 In 1923 Rudolf Belling designed a bonnet mascot for the Horch make of car, the so-called Horch animal. The body of the mythical creature borrows elements from automobile design, the wide open ears are the visual realization of the brand name (the German word “Horch“ means “listen“). However, because of the restructuring and renaming from Horch into Audi the figure never went into industrial production. 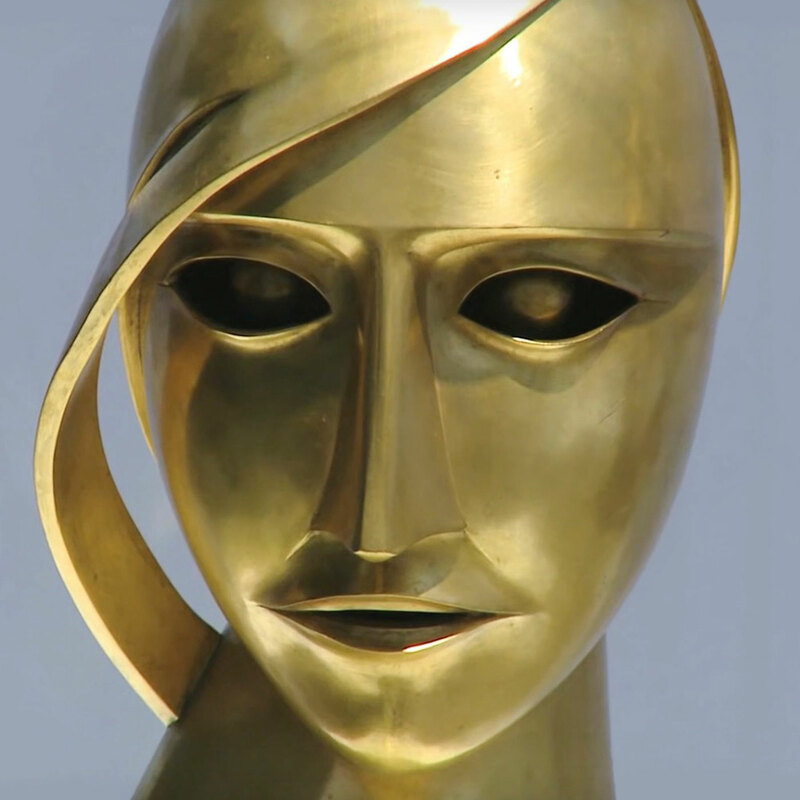 The Head in Brass – avantgarde or Art Deco style? 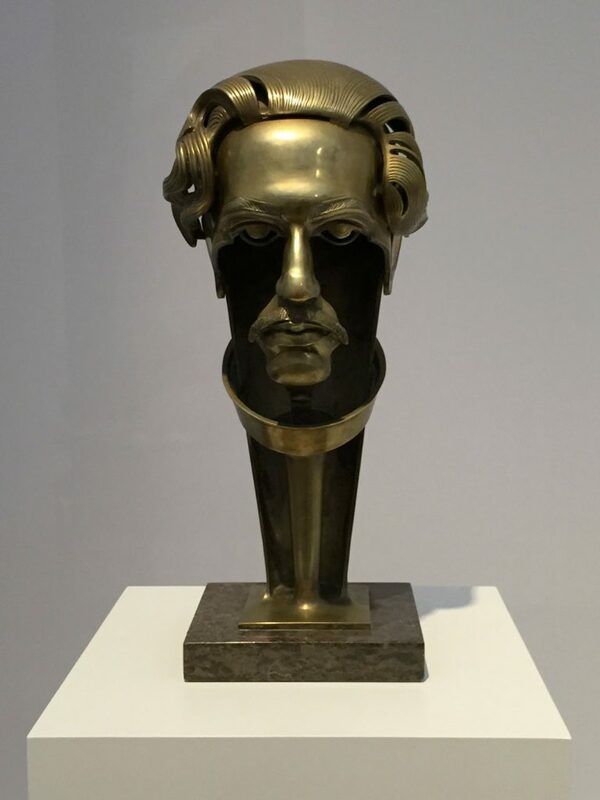 Among Rudolf Belling’s most important works is the Head in Brass created in 1925 which represents the figurative counterpart to the abstract Dreiklang at the same time. The female portrait radiates cool elegance that anticipates the aesthetics of the machine age and the Art Deco style. With its android-like clear cut features the Head in Brass could be seen as direct precursor of the machine woman Maria from Fritz Lang’s classic movie Metropolis, and also the droid C3PO from George Lucas’ Star Wars saga might be inspired by it. 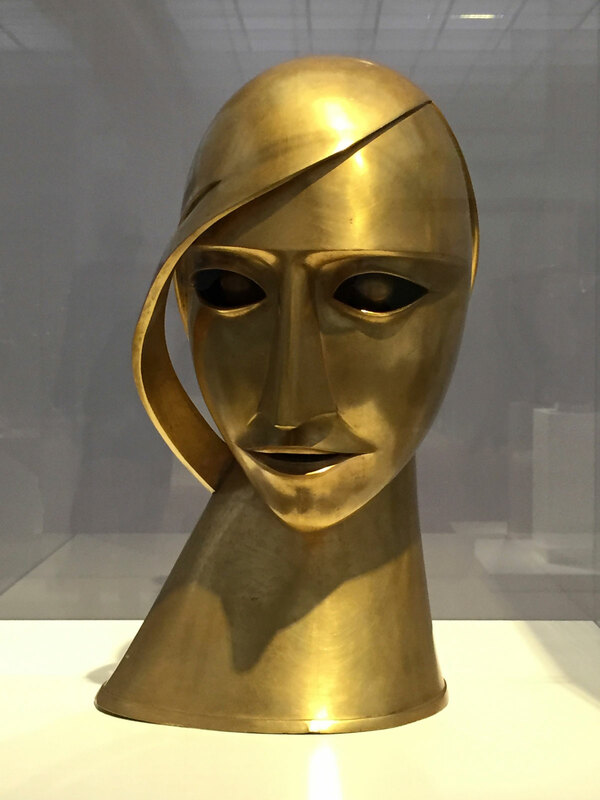 The Head in Brass is one of the masterpieces of modernism in Germany, but nevertheless for a long time art criticism was divided about how to judge this cross between technoid futurism and female gracefulness that characterizes the polished surfaces of Belling’s works. The critiques couldn’t agree on if Belling’s sculptures were avantgarde or Art Deco style and considered them as decorative objects for extravagant lounge design. In general art history has got a problem with art that carries the image of being Art Deco style still today. The origins of the Art Deco style can be traced back to the foundation of the Wiener Werkstaette that combined the organic design vocabulary of Art Nouveau with linear aesthetics. The Art Deco style had its international breakthrough after the exhibition “Exposition internationale des Arts Décoratifs et industriels Modernes“ in Paris in 1925 which celebrated the outstanding position of French taste and the luxury goods inspired by it. The overcoming of genre boundaries that characterizes the Art Deco style which was applied to fine arts and industrially produced objects as well was consistent with Rudolf Belling’s maxim. However, the decorative flatness and the eclectic mixture of styles which are typical of the Art Deco style were criticized by art critiques as superficial. In the 1920s the attitude to life was characterized by youthfulness, glamour and enjoyment to forget the nightmare of World War I. Neon advertisements conquered the cities and Paris as capital of modernism was nicknamed “city of light“. 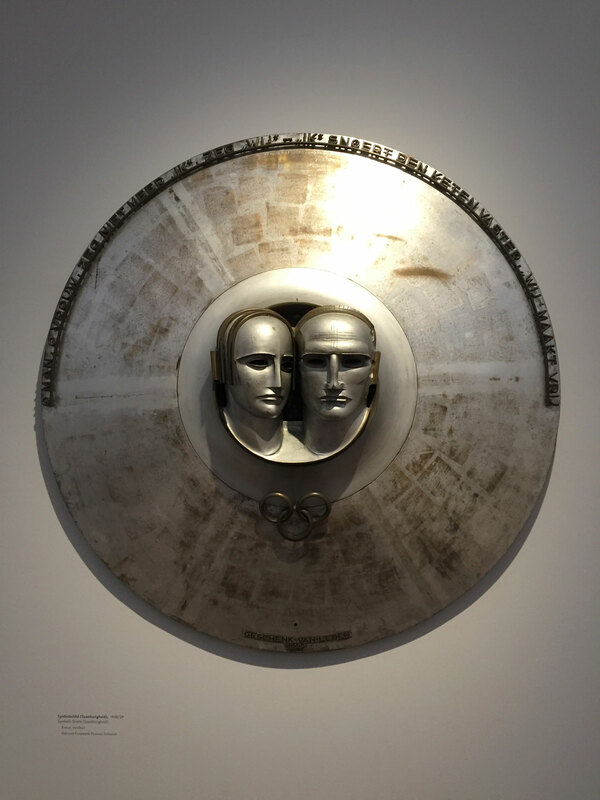 Rudolf Belling sought to express the glamour and light effects of the new era, the dawning of a better future also in the surfaces of his sculptures which, however, were criticized for being artisanal. 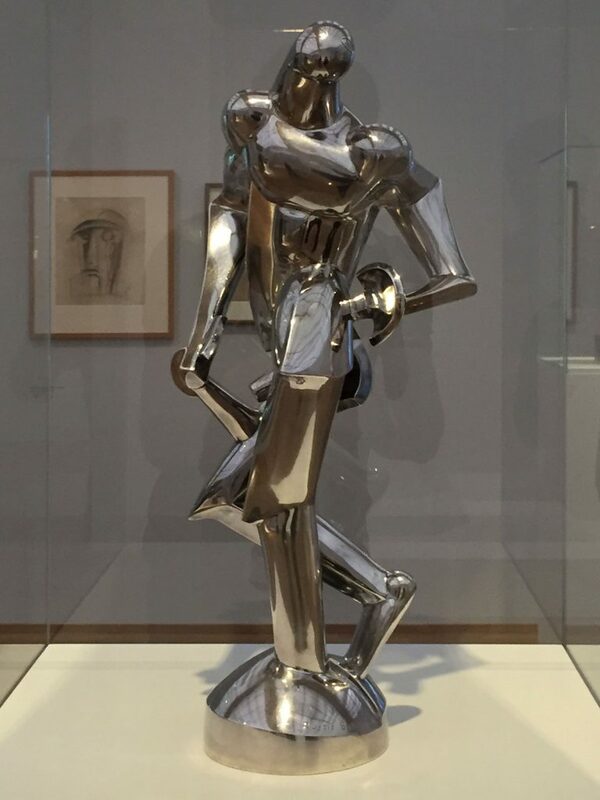 The Art Deco style represents the summary of classical modernism with all its contradictions and therefore always has been difficult to categorize in art history. Also the paintings by Tamara de Lempicka, icons of the Art Deco style, can’t be found in museums throughout the world, as they cannot be assigned to any school and for many art critiques only stand for the superficiality of this era obsessed with consumption. With Rudolf Belling it’s even more complicated as he didn’t only question genre bounderies with his excursions into design, but also pursued a non-committal approach in his use of aesthetic means between figuration and abstraction. 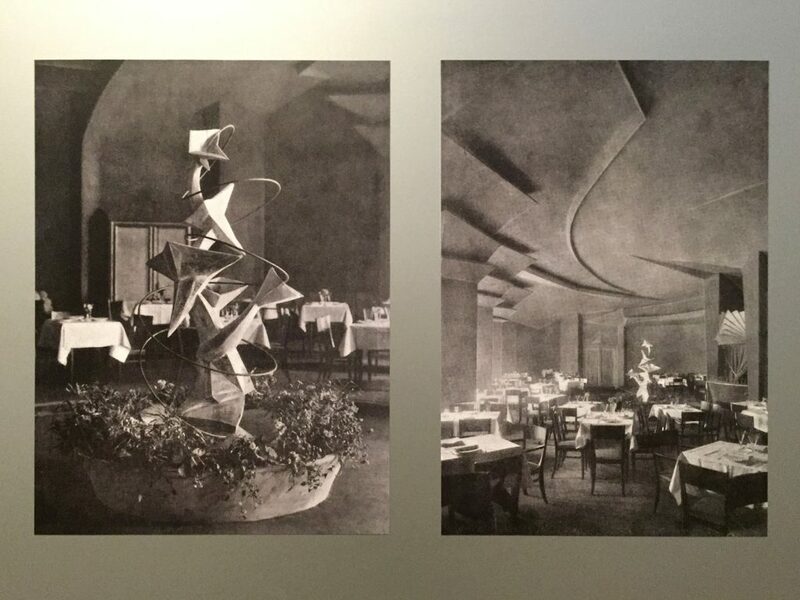 Also interior design was one of Rudolf Belling’s fields of activity as designer. He also gained reputation as an architectural sculptor. When the famous Scala theatre in Berlin was turned into an ice and dance palace in 1920, Belling got the commission to design the interior together with the architect Walter Wuerzbach. 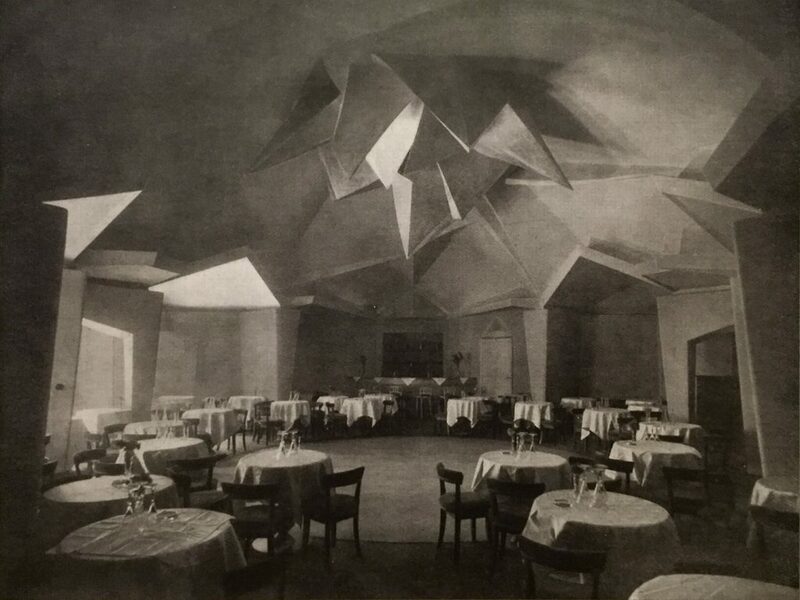 He designed the interiors of a dance casino and a wine tavern in an expressionistic design vocabulary blending sculptural and architectural elements into a spatial gesamtkunstwerk. An illuminated fountain consisting of crystalline forms was the highlight of the interior. In the early 1920s the automobile industry in Germany was born which required investments in traffic related infrastructure. In collaboration with architect Gellhorn and engineer Knauthe Belling developed a roofed service station as rotunda which represents an entirely new type of building. The letters OLEX were planned as neon advertisement to accentuate the modernity of the futuristic building. When a modern villa was erected in Berlin Westend under the architectural direction of Arthur Korn in 1922, Richard Neutra was in charge of designing the garden and Rudolf Belling of developing a moveable fountain sculpture, in 1924 trick fountains for the winter garden followed. 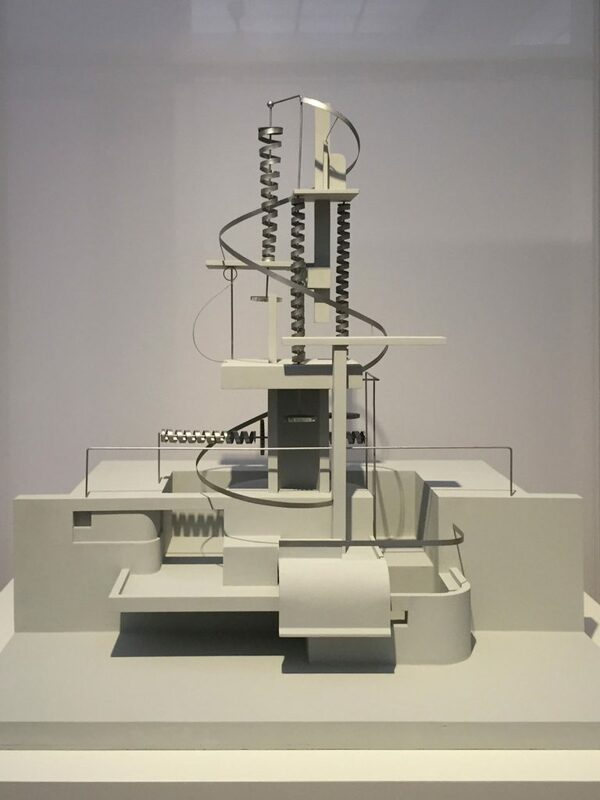 Belling adopted the constructivistic forms of the architecture and tried to disrupt the static appearance of the sculpture by using moveable spirals with water flowing in it, thus becoming a pioneer of kinetic art. In 1933 the owner of the villa, Ismar Goldstein, was dispossessed, after the war the villa was torn down. Belling was the only artist who was ostracized and celebrated by the Nazis at the same time. 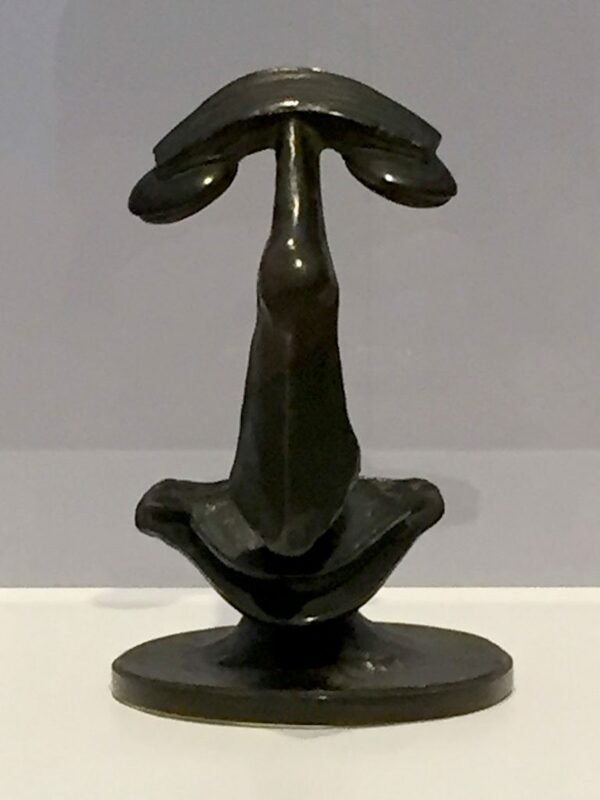 Parallel to his design jobs Rudolf Belling also executed portrait sculptures, for social democratic party bigwigs, as well as his gallerist Alfred Flechtheim and Joseph von Sternberg. The traits of Flechtheim are reduced to a minimum, only the mouth, nose and eye areas are remaining, the head is left out. Belling made the portrait of film director Joseph von Sternberg in 1933, when he came to Germany from the USA in search of a main actress for his movie The Blue Angel. Belling accompanied von Sternberg during his search, finally Marlene Dietrich became the actress of choice who rose to international fame through this role. In 1931 Belling became member of the Preussische Akademie der Kuenste in Berlin, but then dark clouds were already gathering over the instable democracy of the Weimar Republic. The global political situation deteriorated rapidly due to the collapse of the New York stock exchange in 1929 and the Great Depression resulting from it. The unstoppable rise of fascism in Europe and the advance of the National Socialists in Germany put an end to the era of the artistic avantgarde and classical modernism. After Hitler’s seizure of power Rudolf Belling was increasingly boycotted, he was denied a professorship, which is why he quit the academy of arts. 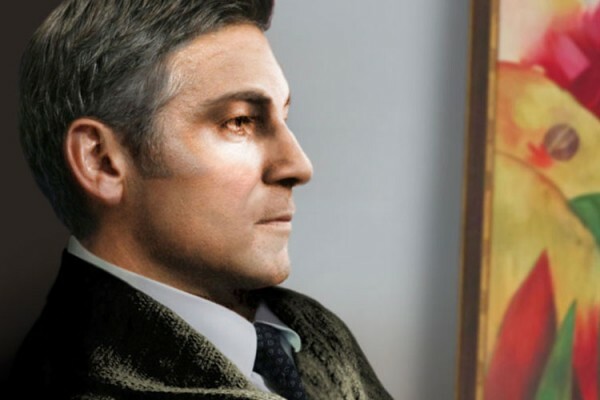 The year 1935 he spent in New York because of a teaching assignment, when he returned in 1936 he saw himself forced to leave Germany irrevocably and go into exile. With the support of architect Hans Poelzig, a friend of Belling’s, he got a teaching assignment in Istanbul which he used to emigrate. His studio in Berlin and numerous works he had to abandon. That Rudolf Belling’s estimation was right become obvious in 1937, when the National Socialists presented their defaming propaganda show Degenerate Art at the Hofgartenarkaden in Munich. Belling was represented by two works, the Dreiklang and the Head in Brass. The day before the Grosse Deutsche Kunstausstellung at the newly erected Haus der Kunst had been opened, an exhibition that showcased the National Socialist petit bourgeois aesthetics. 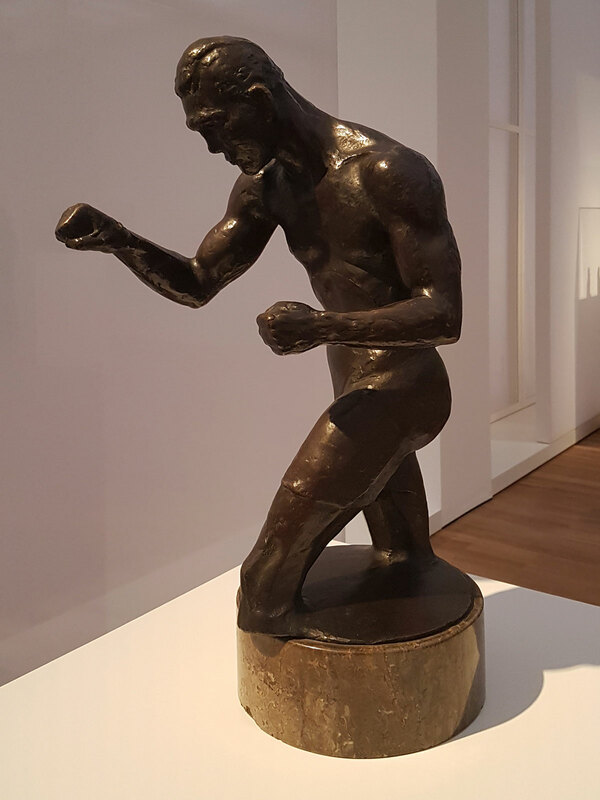 Paradoxically Rudolf Belling was represented here as well by a bronze figure of boxer Max Schmeling from 1929. The faux pas to present a degenerate artist in an exhibition that was meant to glorify the artistic ideals of the National Socialists had been noticed by the organizers too late. Consequently, in the official exhibition text Belling’s admission was glossed over as public “will to reconciliation with the reprimanded“. Between Turkish state art and abstraction. The press was forbidden to report on the affair, but Belling’s presence in both exhibitions had struck the audience, after numerous protesting letters his works were withdrawn from the Degenerate Art exhibition. The naturalistically shaped sculpture of Max Schmeling was allowed to stay at the Haus der Kunst due to his incredible popularity. At this time Belling had gone into exile to Turkey already, where he established the program of study sculpture at the academy of fine arts in Istanbul. In view of the threat of war in Germany this saved him the draft to the military service and the bitter escape into inward exile. Then the secular Turkey of Kemal Atatuerk was a cosmopolitan country that sought to modernize its education system following the example of the western world. 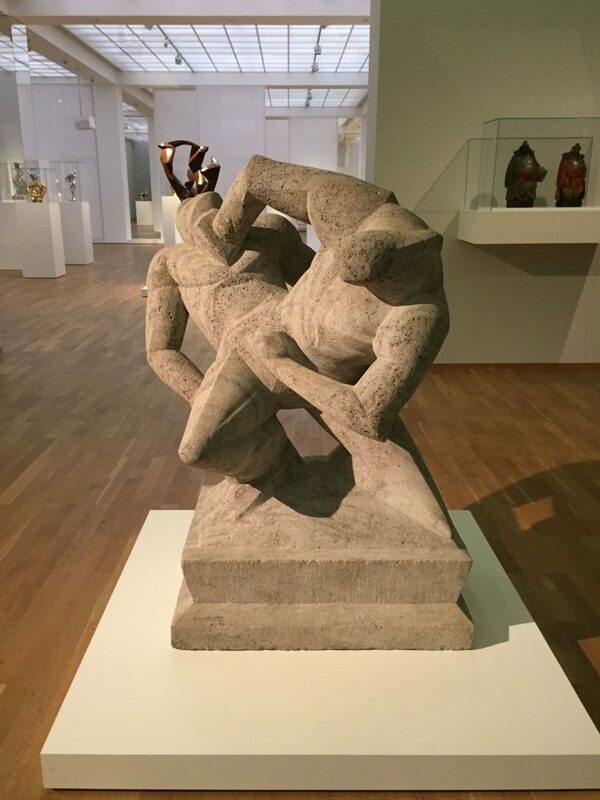 As there was no tradition of figurative sculpture, Belling started with the ancient world to communicate the teachings of sculpture. He received several commissions for representative state art, among them a statue of the new president Ismet Inoenue in 1943, he resorted to design elements from the 19th century for. In 1944 Belling’s residential house and his studio in Berlin-Lichterfelde were bombed and many drafts and originals destroyed. 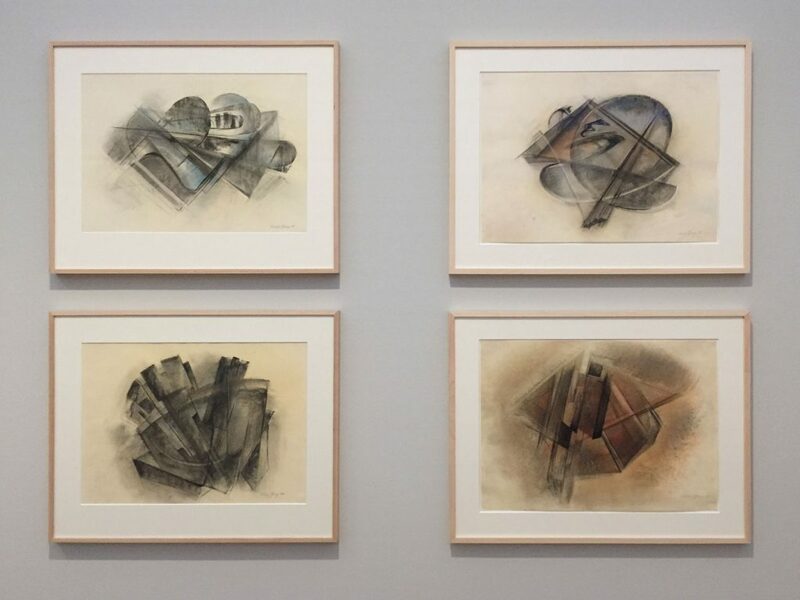 After the end of the Second World War Rudolf Belling turned his attention to abstraction again, to the matter of shape in space, spatial dynamics and the empty space as design element. In 1949 he created the abstract Sculpture 49 in memory of the Dreiklang which he had thought to be destroyed. However, it had survived the bombing and returned to the Nationalgalerie. Until 1966 Belling stayed in Turkey before he returned to Germany at the age of 80 and settled down in Krailling near Munich. http://thomas-michel-contemporary-art.de/weimar-republic/?lang=enIn post-war Germany, however, he couldn’t continue his success in the Weimar Republic. To emigrate to Turkey in order to escape the dictatorship of the National Socialists and war turned out to be fatal for the continuation of his career, as Istanbul was cut off from the international art market. After the war the international capital of art had shifted from Paris to New York and Abstract Expressionism had started its conquest of the art world. Rudolf Belling’s return to abstraction and his triumph over the cultural policy of the Nazis at the Degenerate Art exhibition didn’t help him much. 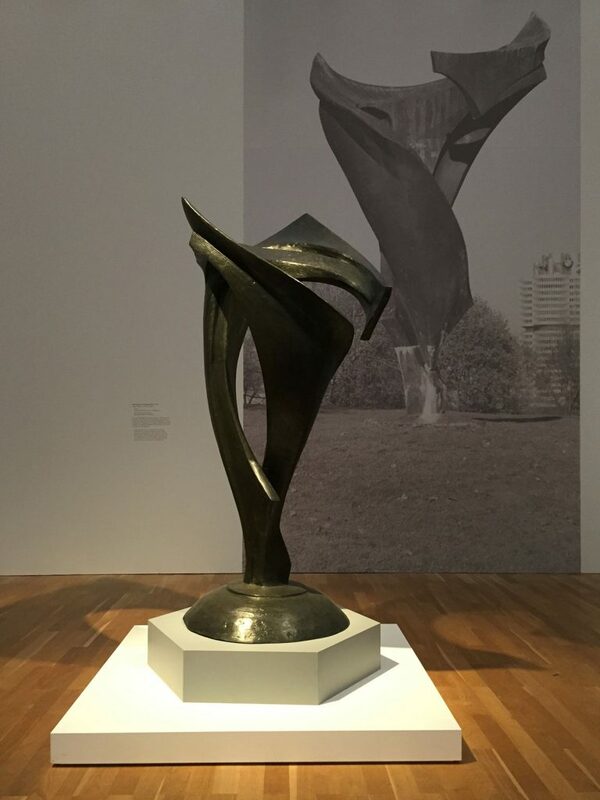 The misappropriation of his naturalistic Max Schmeling bronze by the Nazis aroused suspicion among the intellectuals of the post-war era, his pioneering achievements with regard to abstract sculpture were forgotten, with the consequence that he even ranked behind Arno Breker. Belling’s commissioned works for the Turkish state weren’t necessarily helpful to counter this perception. Art for the Olympics – Rudolf Belling’s final curtain. Among Rudolf Belling’s late work are three major commissioned works which he could realize in the Federal Republic of Germany, such as the Sail Motif I which was placed in front of the Bank der Gemeinwirtschaft and the Symbol of Community for a housing complex of the cooperative building association Neue Heimat. His last work in public space was his Flower Motif as a Peace Symbol which he created on the occasion of the Olympic Games in Munich in 1972. The six meters high sculpture which had been conceived for the Olympic park originally was planned to be placed at the top of the hill which had been filled up with war debris, but after a fierce political dispute on a local level which had been preceded by a protest of the Olympic architects the bronze sculpture, nicknamed “Schuttblume“ (Rubble Flower), was placed on a hollow surrounded by trees. Rudolf Belling didn’t live to see the unveiling anymore, he died in 1972 at the age of 85. 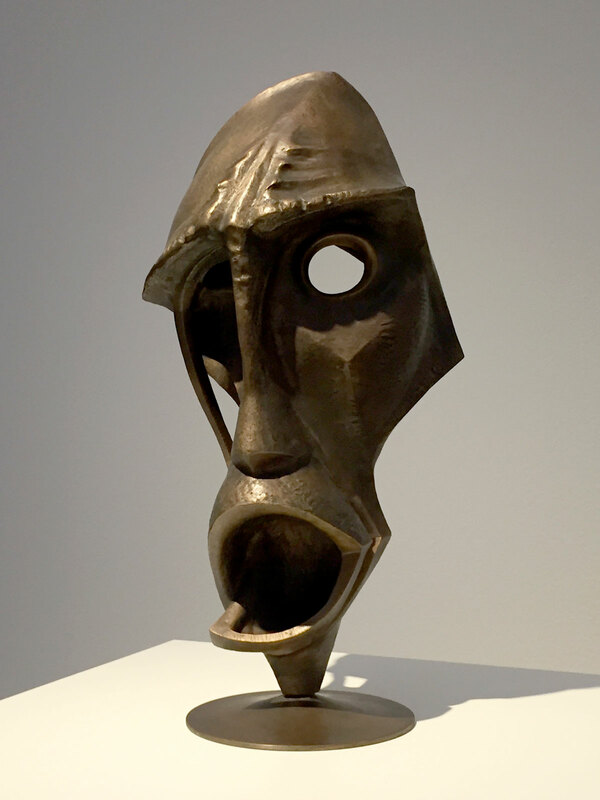 That he mistrusted the art theorists he showed in his abstract sculpture Mask of an Orator from 1959 the mouth of which literally discusses art to death. Purists who had criticized Belling’s versatile adaptability never have understood that his approach wasn’t about the appearance but the logic of an inner necessity that can be expressed in any shape between figurative and abstract. His commercial instinct he used his sculptural talent for to design products appears so contemporary and legitimate from today’s perspective that the criticism of the traditionalists is hardly understandable, as at the latest since pop art this argument isn’t valid anymore. Belling’s aspiration to unite art with craft and life is more relevant than ever, just like the Dreiklang his entire ouevre requires to be viewed from all sides to capture it with all its facets. In his work figuration and abstraction are just as mutually dependent as form and space that surrounds it. The disruptions of the 20th century can be read in his work as clearly as in no other artist’s. His biography is also a mirror of the history of Berlin, which is about rediscovering Rudolf Belling now. The retrospective at the Hamburger Bahnhof was extended until October 29, 2017.